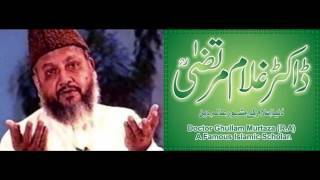 Dr. Ghulam Murtaza Malik Famous Islamic Scholar on Sirat-e-Mustaqeem. He was one of the famous religious scholars whose programs on TV were regularly watched by the masses. 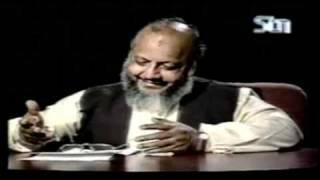 Although he is no longer with us but he is still present in the form of his teachings through Islamic lectures and the books published by his educational trust..He Did this program in the holy month of Ramadan in which he explained the selected ayats/Verses of Quran. G. M. Syed (January 17, 1904 — January 19, 1992) (Arabic script: جی۔ ایم۔ سید) (abbreviation of Ghulam Murtaza Shah Syed; Arabic script: غلام مرتضی شاہ سید) was a Sindhi activist, revolutionary and sufi. He is known by people of Sindh as "Saeen" the honoured name, son of Syed Mohammed Shah Kazmi, descendant of a famous saint of Sindh, Syed Haider Shah Kazmi, of whose mausoleum, he is the sajjada nashin. He is from the lineage of Prophet of Islam, Muhammad.